Disclaimer: This post contains affiliate links. Oh My! Omaha is a participant in the Amazon Services LLC Associates Program, an affiliate advertising program designed to provide a means for sites to earn advertising fees by advertising and linking to amazon.com. If you’ve spent any time in Omaha, there’s a good chance you’ve walked along the Lewis & Clark Landing – that riverfront development along the Missouri River. You’ve attended festivals to gorge on roasted corn on the cob and listen to music and you’ve crossed the Bob Kerrey Pedestrian Bridge so you can take that Nebraska-Iowa state line photo opp. 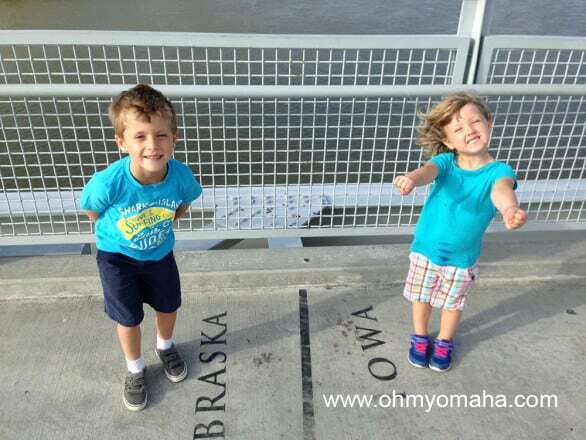 Photo opp on The Bob, as the pedestrian bridge over the Missouri River is affectionately called. And there’s a good chance you’re like me and totally missed the fact that right there on the river front is some National Parks Service property. Omaha’s right on the Lewis & Clark Trail. 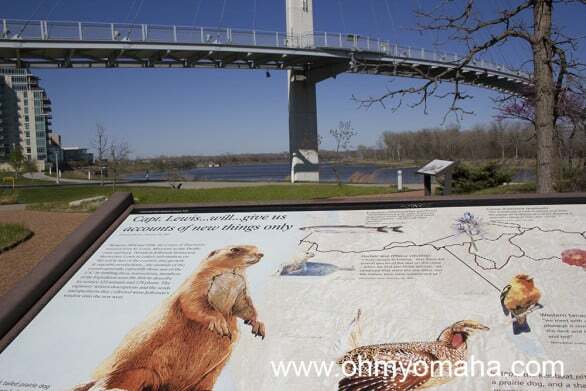 At the foot of the Omaha side of the pedestrian bridge is the Midwest headquarters of the Lewis & Clark Trail, a national historic trail managed by the National Parks Service that meanders 3,700 miles through 11 states. The Corps of Discovery, led by Meriwether Lewis and William Clark, traveled the Midwest up to the northwest coast in search of the Northwest Passage from May 1804 and September 1806. Much of that journey was spent going against the current on the Missouri River. 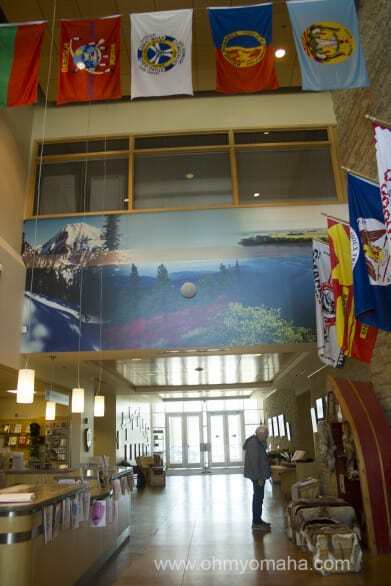 The Missouri River played an integral role in the journey of Lewis & Clark, so it’s not surprising that a visitors center was built along its shores. It was just surprising to me. The headquarters is housed in a building that’s, quite frankly, forgettable in an office building sort of way, despite of the National Park Service signs and the visitors center stands encouraging you to come in. 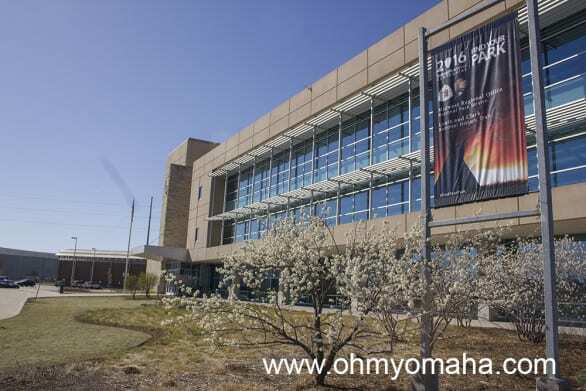 The National Parks Service’s Midwest Region headquarters to the Lewis & Clark Trail is in Omaha. My family has walked through the outdoor area, ignoring the signs explaining the significance. I’ve ran by and, in passing, wondered what was inside and then dismissed the thought. Since the National Parks Service is celebrating its 100th birthday, I decided to remedy the situation. It was time to look inside. 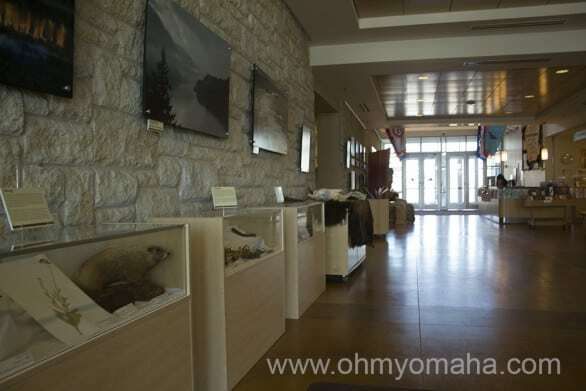 The Lewis & Clark Trail Headquarters Visitors Center in Omaha is contained to a lobby. The visitors center is small, and you can figure 20 or so minutes to look at each display. The displays are themed based on some of the discoveries Lewis & Clark noted throughout their journey – biology, indigenous cultures, etc. 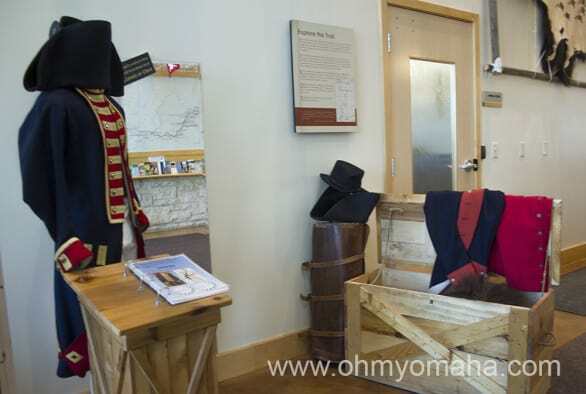 Replicas of artifacts collected during the Corps of Discovery’s journey are on display in Omaha. While there, you can view a shortened version of the documentary “Ken Burns: Lewis & Clark: The Journey of the Corps of Discovery DVD.” It’s about 20 minutes and a great condensed history of the trail. Or you can buy the 2- disc DVD documentary by Ken Burns and watch all 240 minutes of it. Whatever floats your boat. If your kids have to touch everything they come across, they’re in luck. Some displays have animal furs and replicas of artifacts for them to touch. There are several hands-on displays that make a stop here worth it for families. I tried my hand at writing – poorly – with a quill feather. Kids will most likely enjoy the animal display and the dress up center. Children can imagine themselves as a member of the Corps of Discovery as they sort through the costume trunk. The outdoor area, especially in the spring and summer, is a nice place to explore with children, as well. There’s a short trail to walk on the north lawn of the headquarters, and it features informative signs your kids will ignore. Tip: Keep the Lewis & Clark theme going during your visit to Omaha and head to the Henry Doorly Zoo where they’re showing “National Parks Adventure 3D” on the IMAX screen right now.